David Herd was the 458th player to appear for Arsenal. Highly thought of at Highbury, this Scottish International goal machine had to leave Highbury to gain well deserved winners medals elsewhere in the 1960s. Born on 15 April 1934 in Hamilton, Lanarkshire, his mother went north to family just prior to his birth so he could qualify for Scotland like his father. His father helped Manchester City win the FA cup a few weeks after David’s birth and he grew up in Moss Side beginning his professional career at Stockport County as an amateur in 1950. He signed professionally a year later and in May 1951 played as a 17 year old in the same Stockport forward line up as his 39 year old father Alec. David scored in the 2-0 win. Herd caught the eye of Matt Busby in 1952 but a hiccup scuppered the transfer deal and he remained at Edgeley Park in the 3rd Division North. National Service intervened and for two years he was in the RAF, and a few hours after his demobilisation Tom Whittaker swooped to purchase him on 24 August 1954 for £10,000. 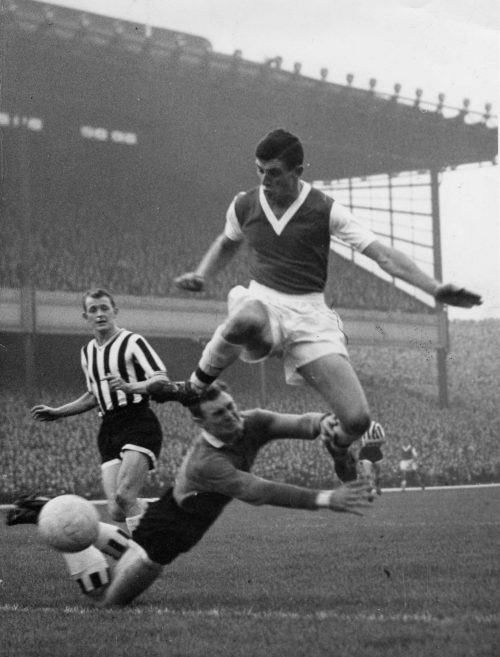 Herd made his Arsenal debut on 19 February 1955 at home to Leicester, and took a while to bed into the team but between 1957-1961 he was the leading Arsenal goalscorer for four successive seasons. One of these goals was scored for the Gunners in the Busby Babes’ last match on English soil, a 4-5 defeat at Highbury on 1 February 1958, often noted as one of the greatest ever games. For Arsenal Herd scored 107 goals in 180 appearances & at one point an explosive right foot missile of his was timed at 72.5 mph, it being no surprise he was nicknamed “Hot Shot” Herd. He is the club’s 16th highest ever goalscorer, with a hit ratio of 0.594 goals per game, which places him just outside the all time top ten of Arsenal’s best strike rates. 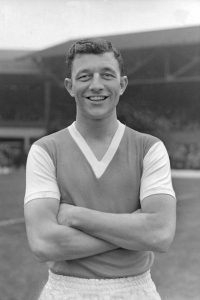 He also played 85 games in the reserves and scored 46 goals, one of which was in the 1954-55 final of the London FA Challenge Cup in which Arsenal beat West Ham. His final match for the club came on 29 April 1961 at Everton, where he scored in a 1-4 defeat. Despite all his goals the best League position while at the club was third in 1958-59, and it would have been understandable were he to look elsewhere for the chance of honours. This course of action appeared to be encouraged as manager George Swindin offered him as a makeweight in deals for both Denis Law and George Eastham in March and September 1960. More than hinting he was not part of the manager’s longer term plans, it was somewhat ironic as Herd ended up the 2nd highest scorer in the whole of the top flight during the 1960-61 season. Consequently Herd moved to Manchester United on 26th July 1961 for £40,000. There he won 2 League and 1 FA cup winners medals, and he also received a European Cup winners medal as a squad member. A broken leg in 1967 put paid to his position in their forward pecking order. He is 13th in Manchester United’s all-time goalscoring list, 145 goals from 265 appearances, which was almost identical to his scoring ratio while at Arsenal. On 15 July 1968 he moved to Stoke City on a free transfer, and then onto Waterford briefly in 1970 before ending his playing career which had seen him net 272 times in 516 appearances! A Scotland international, he scored 3 times in the 5 occasions he appeared for his country between 1958-61. All of these caps were won at Arsenal which aside from being a ridiculously low total for such a natural goalscorer, is an indictment of the SFA in repeatedly ignoring a title winning forward. A short spell as manager of Lincoln City in the early 1970s saw the his football career come to a halt and he ran a number of Manchester based car garages before retiring in 1999. He also enjoyed playing golf and cricket. David Herd passed away on 1 October 2016. As a mark of respect on 2 October 2016 both Manchester United and Stoke paid tribute to Herd, by wearing black armbands in their Premier League match at Old Trafford.